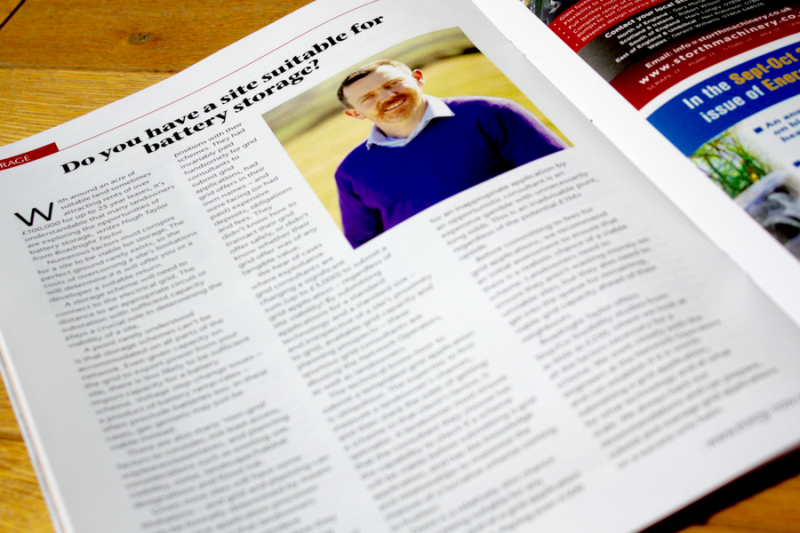 Do you have a site suitable for battery storage? This article by Hugh Taylor was first published in Energy Now magazine in July 2017. With around an acre of suitable land sometimes attracting rents of over £100,000 for up to 25 year leases, it’s understandable that many landowners are exploring the opportunities of battery storage. Numerous factors must conspire for a site to be viable for storage. The perfect ground rarely exists, so the costs of overcoming a site’s limitations will determine if it will offer you or a developer a suitable return. A storage scheme will need to connect to the electrical grid. The distance to an appropriate circuit or substation with sufficient capacity plays a crucial role in determining the viability of a site. A point rarely understood is that storage schemes can’t be accommodated on all parts of the network. Even given capacity on the grid to export power from your site, there is less likely to be sufficient import capacity for a battery scheme. Voltage step-change issues – a product of battery ramp-rates – often preclude batteries too. In these cases, gas gensets may just be viable instead. There are also many ‘non-grid’ factors to consider, not least access, wayleaves/easements, and planning considerations such as existing use, visibility, noise, landscape/habitat designations and flood risk. Given most sites will have some limitations – and grid and planning can only be formally determined by means of expensive application processes – it is important that landowners commission an independent assessment of their site before they commit to any grid and planning application costs, or professional and legal fees. When I spoke at Energy Now Expo in February this year, I was taken aback by the number of people who approached me who were in difficult positions with their schemes. They had invariably paid handsomely for grid consultants to submit grid applications, had grid offers in their own names – and were facing (or had paid) expensive deposits, obligations and fees. They didn’t know how to transact their grid offer safely, or didn’t know whether their grid offer was of any tangible value. We hear of cases where exploitative grid consultants are charging a significant sum (up to £3,000) to submit a grid application – regardless of site viability! By submitting applications for a standard technology and a standard size – and irrespective of a site’s proximity to grid, available grid capacity and planning prospects – these spurious grid consultants are abusing the Network Operators, as well as landowners. The technical know-how to submit a templated grid application is ubiquitous. The expertise to first measure a landowner’s chances, and then stack the odds of getting a scheme in that client’s favour, is specialist. A landowner must ensure that the consultant they choose has the capability to check if a scheme will be viable before submitting a grid application, and has the knowledge and relationships to maximise the chances of a lucrative scheme coming to fruition. There is a relatively slim chance of a site being suitable for any technology and of a grid application being successful. Paying even £500 for an inappropriate application by an opportunistic consultant is an expensive gamble with unnecessarily long odds. This is an inadvisable punt, regardless of the potential £1 million+ upside. Before committing to fees for grid applications, we recommend an initial assessment to ensure that there is a realistic chance of a viable scheme. Landowners need to ensure they aren’t wasting money on unviable sites, but they also need to get into the queue for remaining, viable grid capacity ahead of their neighbours. Roadnight Taylor offers Stop/Go feasibility studies from as little as £350 plus VAT, where we look at all the factors necessary for a scheme. We work closely with the engineers at the Network Operators and can establish if it is worth submitting a grid application, for what technology and at what scale. We always back our recommendations and can prepare, submit and manage grid applications on a success-only basis. Call us to today on 01993 830571 to find out more about our Stop/Go studies from as little as £350 plus VAT. Alternatively, email us via our Contact Us page. Having worked in the energy industry for over six years, Hugh sits on expert panels for all six the UK Distribution Network Operators (DNOs). He also has a deep understanding of National Grid’s Capacity Market and its various balancing markets, is a regular consultee to BEIS and Ofgem, and is a popular speaker at industry events.